The Compulsive Reader: Guest Post from Uma Krishnaswami! One of the first middle grade books I read this year was The Grand Plan to Fix Everything by Uma Krishnaswami, and I loved it. It was fun and energetic, and the characters were so vivid. 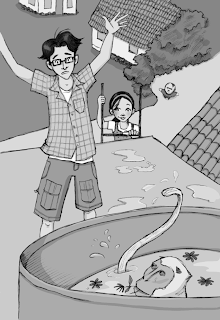 I'm so happy that a sequel has been released--The Problem With Being Slightly Heroic--and I'm even more delighted to have Uma Krishnaswami on the blog today to talk about one of my favorite characters, Dini's father! When I was writing The Grand Plan to Fix Everything, Dini’s father formed quite naturally on the page. He was a little absent-minded. He was busy with his own work, yet happy to follow Mom when she moved the family to India to take on the job of her dreams. I think unconsciously I gathered traits for him from men in knew in my life—my father, my husband, my son. He’s got a few traits from all of them, and some of his own that evolved over time. He gained a penchant for puns and gadgets. He became a computer geek. At the same time, he grew sensitive to his daughter’s moods. But I couldn’t make him too competent, because that wouldn’t give Dini room to work through her own problems, so he grew a kind of well-meaning but sometimes bumbling air about him. In his own way he runs into as much trouble as she does. 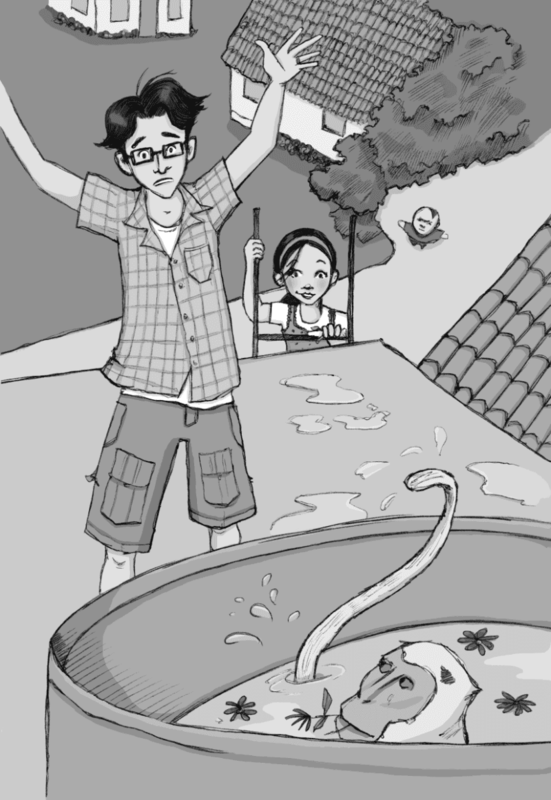 He doesn’t know the little town of Swapnagiri any better than Dini, so they end up being allies as they find their way around in their new home. Back in the U.S. for The Problem With Being Slightly Heroic, Dad is on more familiar ground, so we see him take charge a little bit more. He has to drive the girls around, and he’s reconnecting with people he knows in the area. This also, by the way, gets him out of the way when Dini needs space to hang out with Maddie and Brenna. He’s more parental, however, less of an ally. Maybe that’s because Dini’s pushing the limits a bit more. Maybe it’s also because Mom’s offstage. It was really fun for me to play with all these relationships in the second book. By the time I wrote it, I felt as if I knew these characters. I’d bonded with them while writing the first book and I could see them growing in small but unexpected ways. I’m quite fond of Dad, I realize. He’s a pretty grounded sort of person. In that sense he’s an anomaly, because really, most of the grownups in this story world are utterly bonkers. Not the girls’ mothers, but they play very small roles, so it’s up to Dad to represent adulthood in a sane manner. Even so, I found that while Dini was figuring out what it meant to be slightly heroic, it worked to keep Dad slightly clueless. As I wrote The Problem With Being Slightly Heroic, I learned to keep Dini’s attempts to save the day just that little bit off balance. I’d play them out in tandem with Dad’s efforts to manage his daughter and her friends. The tension between them worked to pull the story along, because of course I could rely on Dolly to spin things madly out of control. Writing Dad’s character taught me a lot about managing parents in fiction. It’s something you have to keep an eye out for when you write for young readers, because otherwise the adults just get meddlesome and want to take over. 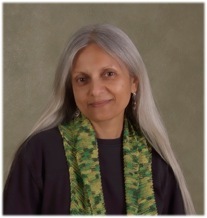 Uma Krishnaswami is the author of several books for children, including the first story featuring Dini, Maddie, and Dolly, The Grand Plan to Fix Everything. She is also on the faculty of the Vermont College of Fine Arts MFA program in Writing for Children and Young Adults. Ms. Krishnaswami was born in New Delhi, India, and now lives in Aztec, New Mexico. To learn more, visit her website: http://www.umakrishnaswami.com/. As an added bonus, I have one copy of The Problem With Being Slightly Heroic to give away! Just fill out the form to enter! Yay!!! I sooooo loved The Grand Plan to Fix Everything, so I HAVE to have this book! Thanks for featuring Uma and her new book.